CHAAIIIRRR. Sin...beating Zim...with a chair. 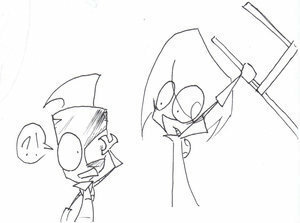 Wallpaper and background images in the Invader Zim FanCharacters club tagged: zim sin and chair. Saphhire:i may love him....BUT I NEVER PASS UP THE CHANCE TO BEAT SUM1 WIV A CHAIR!! !LEMME HELP!!!!!!!!! !